As a child in North Dakota, Low-Light was afraid of the dark, timid with animals, and shy of loud noises . . . until one precarious hunting expedition with his father. Low-Light somehow lost his way in the impenetrable darkness. He was found three weeks later with his flashlight, .22 rifle, and a grin from ear to ear. Ten years later he was an instructor at the Army marksmanship program in Fort Benning and a self-taught expert on image intensification. 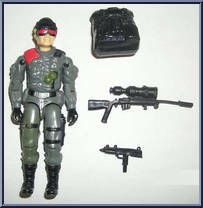 "The Joes like to have Low-Light along for the ride. They know that if something gets really heavy, and that's bound to happen sooner or later, all they have to do is wait until dark . . . it doesn't matter what field of fire the bad guys control-the night belongs to Low-Light."